Some of the best video games all have a few things in common, but perhaps the most important are memorable characters. Assassin’s Creed Origins delivers not only the best protagonist in series history with Bayek of Siwa, but it also treats it setting, Ptolemaic ancient Egypt, as a character in and of itself. Egypt is a living, breathing world with problems, spirit, culture, and personality. While the main storyline serves as Bayek’s story of sorrow, vengeance, and servitude to his people, as well as the actual tale of how the Assassin’s Brotherhood started, it is in the side quests and random exploring that Egypt tells her tale of war, pain, and potential death. Assassin’s Creed Origins was developed by Ubisoft Montreal, the same studio that gave us what many consider to be the last “quality” Assassin’s Creed title: Assassin’s Creed IV: Black Flag. After the questionable releases in the franchise with 2014’s Unity and 2015’s Syndicate, Ubisoft decided to take a year off from delivering an AC title, (though in 2016, we were given the mediocre Assassin’s Creed film starring Michael Fassbender) and the extra year of development really shows. Instead of a title overwhelmed by time restraints, mediocre stories and characters, and uninteresting side quests, Origins represents a return to form for a series that was in desperate need of a fresh take. Bayek’s main story is the driving force behind the game, and at taking nearly 30 hours to complete, no stone goes unturned. Bayek is one of the last Medjay, an order of warriors who once served as the Pharaoh’s bodyguards, but now are simply protectors of Egypt and her people. After the death of a family member at the hands of The Order, (precursors to the series antagonists, the Templars) Bayek and his equally badass wife, Aya, went searching for the men responsible. Aya is playable for a couple of short missions, mostly involving naval warfare similar to Black Flag, but this is not a fully fleshed out gameplay element, only appearing a handful of times. Though Aya is controlled by players only a few times, she is a very important part of the story, as Bayek’s wife. She shares his pain and lust for revenge, though she also becomes the catalyst for Bayek to become involved in situations about the good of Egypt as a whole. Through your quest, you will meet historical characters, such as Julius Caesar, Cleopatra, and more, who are not only involved in the immediate story, but also put into play events that give shape to the world of Assassin’s Creed in games that take place chronologically later. There is a modern-day story to ACO, but it never wears out its welcome. While not quite as involved as the Desmond story lines from past titles, and not as pointless as the others, there are things fans of the franchise can appreciate through these sections of the game, like Easter eggs referencing previous games and even the 2016 Assassin’s Creed movie. Without voyaging into spoiler territory, the present-day aspects seem like they are finally becoming important again given the events at the end of the game. This is a welcome change, as this is something that has been sorely missing from the franchise since the end of Desmond’s story in ACIII. Bayek is such a superb character, and I have no qualms about awarding him the title of best character in the series to date. Instantly, Bayek is relatable and has extremely human qualities about him. He’s not the reluctant hero we have come to play as in most past Assassin’s Creed titles; he actually wants his country to be a better place and cares about the individuals who call Egypt home. Being a Medjay sworn to help and protect people, side quests feel natural, as lending a hand is something that is totally within character for Bayek. Some of the best moments in the game come from side quests, and a lot of those moments involve children. Bayek understandably has a soft spot for children, and he goes out of his way to make sure they are taken care of and happy, even going so far as to play hide and seek with some, and entertaining others with the series’ trademark leaps of faith. 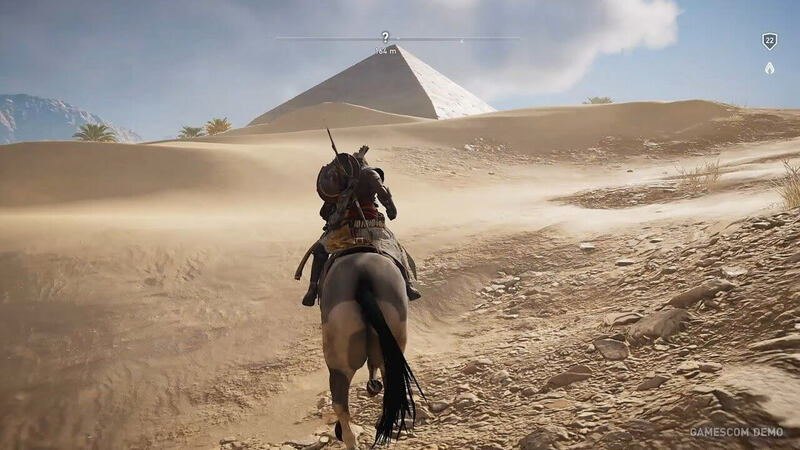 While the story was heartfelt, emotional, and epic, side quests are where the game allows Bayek’s personality to ooze forth, thus creating missions players will want to complete not only for rewards or the sake of completion, but to see their protagonist come even more to life. These side quests vary in both scale and type. Some of them string together many smaller deeds in order to create an actual narrative instead of a simple “go here and kill this” or “go there and retrieve this item” type of deal. Granted, a lot of these quests are fetch or assassination missions, but it’s the way they are presented and given that makes them interesting. As I previously mentioned, each quest adds more to Bayek’s personality in simply the way he addresses people and handles situations. Similar to Black Flag, Origins operates like a much larger open world than other series entries, offering almost the entire country of Egypt to be explored. Other than the side quests and main story missions, Assassin’s Creed Origins contains a plethora of other activities to engage in. There are two gladiatorial arenas to compete in, a colosseum for chariot racing, an immense amount of forts and outposts to fight through, 58 synchronization points to find, and tombs to sift through. Tombs are small areas usually filled with puzzles and platforming elements that award an ability point upon completion. A few of these tombs include special areas that further the narrative of the overarching “First Civilization” story of Assassin’s Creed. This extra bit of story combined with the proper handling of the modern-day tale brings back an excitement for the future that has been truly missing from the series. A small, yet welcome, addition/change from the norm is the transformation of Eagle Vision. In past titles, Eagle Vision acted as a way to pinpoint important items or assassination targets, filtering the screen to look like a sort of heat vision. In Assassin’s Creed Origins, it has become an eagle’s vision, quite literally. 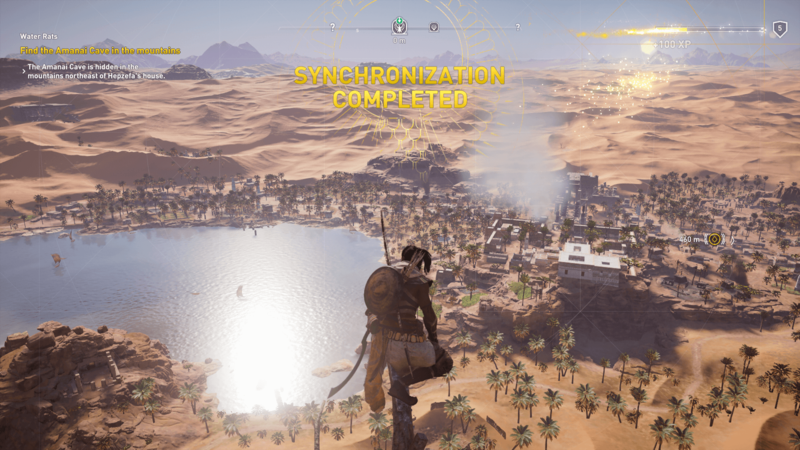 When activated, focus shifts from Bayek to his eagle companion, Senu, flying high in the sky. Senu works like a drone of sorts and can pinpoint targets, treasure chests, enemies, alternate routes into an outpost, and materials. This feature is extremely useful when attempting to scout an area inhabited by many enemies, allowing players to find the best way to accomplish their feat. 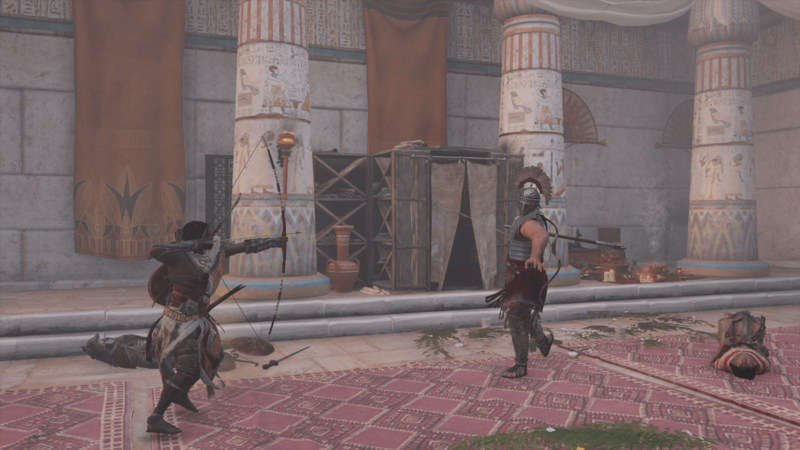 Perhaps the biggest change of form in Origins is the combat system. Operating much like an action-RPG, fighting is reliant on heavy attacks, light attacks, blocking and dodging. Also new is the overpower attack that is gained after a meter is filled by attacking. This attack deals massive damage, almost always guaranteeing an instant death depending on the specific type of enemy and their level. These changes bring a level of skill to taking down enemies that were lacking in the series before Origins, as some areas may be too high for players at certain points, being that they contain higher level enemies that will absolutely annihilate them. This system provides a welcomed challenge. Included in high-tier enemies are Phylakes and War Elephants. Phylakes are expert bounty hunters that plague the map at different levels giving excellent rewards upon defeat, while War Elephants are even more difficult to conquer. These sequences are unforgiving to those not at the proper level, especially War Elephants. Even at the level cap of 40, War Elephants pose a critical challenge that can be very unforgiving if approached incorrectly. Two new additions to the series will outfit players to be able to take down even the most challenging enemies: RPG-like skill trees and a multi-tiered weapon system. Weapons are acquired by purchase, drops from enemies, or rewards for completing activities. Swords, spears, maces, bows, and more are all grouped into different color-coded rarities, with the highest tiered weapons containing unique properties, such as a flaming sword that sets enemies on fire. While not as deep a system as Diablo III or Destiny 2, it is still a major positive that adds something previously missing to the series, as players will find themselves searching for the perfect weapons to fit their playstyles. Skill trees are divided into three sections: hunter, warrior, and seer. Hunter controls effectiveness and use of bows and arrows, along with granting perks to the ranged weapons. Slow motion aiming, both upon a stealth kill and after jumping from high ground, are found here, as well as an upgrade that allows the player to control the direction of an arrow shot out of a specific type of bow. Seer is home to perks like unlocking sleep darts, firebombs, and poison. Also found here is the ability to tame animals and gain better prices when selling goods. Warrior is likely the most attractive tree at first, as it contains upgrades to HP and melee damage. A clear favorite warrior tree skill is the ability to take the enemies weapon and throw it at another nearby enemy when using the overpower attack, granting two instant kills. Assassin’s Creed Origins is damn near perfect in terms of gameplay, graphics, and sound. As ambitious as a title it is, it’s not without a few hiccups. During a 52-hour playthrough, a few bugs and glitches were found in the form of floating rocks, NPCs repeating lines of dialogue immediately after having said them, occasional freezing, and even falling through the map at one point, necessitating a complete restart of the game and causing a bit of lost progress. Overall, Ubisoft Montreal has not only created an amazing Assassin’s Creed game with Origins, but they have also delivered an honest-to-goodness Game of the Year contender. Taking a year off has really shown what can be accomplished with the series given the proper time and dedication. While there are a few technical problems, none of them were game breaking or made me want to give the game up. Even after an aggravating problem occurred, I was always ready to jump right back in and continue my quest. An incredibly detailed and beautiful world, wonderfully scripted side quests, an engaging and emotional main story, and some of the best characters I’ve ever encountered in a video game all come together to form the perfect Brotherhood of Assassins. Assassin’s Creed Origins is a masterpiece and should be experienced by fans of the series, both long-term, and those who have lost interest in the games, as well as those who enjoy games as a whole. Game Director Ashraf Ismail and his team have proven they are the quintessential Assassin’s Creed developers with Black Flag and now Origins, and I’m not sure I want any other team touching the franchise from now on, even if that means the wait in between games is a bit longer. Assassin's Creed Origins is the quintessential Assassin's Creed experience. Boasting both the best setting and protagonist the series has ever seen, even a few glitches and bugs can't keep this game from soaring. Assassin's Creed is back with a vengeance! Tony is a 29-year-old Game Design student from Akron, Ohio. A lifelong gamer, Tony has been playing since receiving an SNES along with Super Mario World for his 5th birthday. He is an avid Xbox fan, though he tends to dabble in some PC gaming from time to time. Some of his favorite games and franchises are Mass Effect, The Elder Scrolls, Halo, Batman: Arkham, Assassin’s Creed, Bioshock Infinite, and Quantum Break, just to name a few. Aside from gaming, Tony is a huge movie fan, with the Star Wars franchise being his all-time favorite movies. Constantly delving into the video games, comics, novels, television series, and films, he looks forward to any new installments in the stories. Marvel’s films and respective Netflix series are also in constant rotation in Tony’s home. Other favorite films include The Dark Knight trilogy, Requiem for a Dream, Donnie Darko, and The Hateful Eight, amongst many more. When not gaming, streaming on his Twitch channel, or mentally living in a galaxy far, far away, Tony enjoys listening to and creating music, reading comics and novels, binge watching shows on Netflix, and spending time with friends and family.